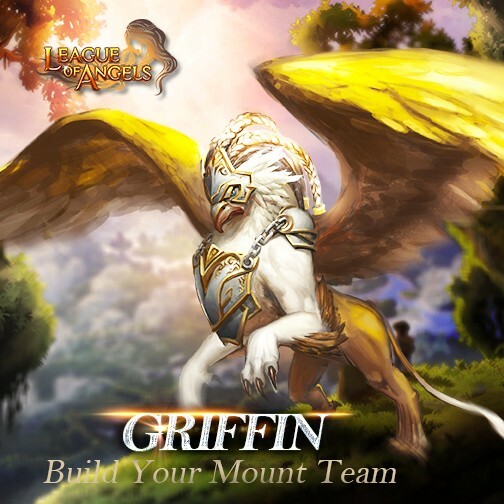 New Mount Griffin Joins League of Angels! League of Angels is happy to announce the release of a brand new Mount! Let the elusive Griffin mount help destroy your enemies! The mystical Griffins are ancient creatures that resemble a cross between an eagle and a lion. Combining the majestic eagle that rules the skies and the fierce lion that rules the land, it is no wonder that the mighty and graceful Griffins are known as the “King all creatures”. Legend says the Griffins migrated to the land of the Angels in an era long forgotten and settled on the snowy peaks of the tallest mountains. Griffins are often seen as guardians of the divine, and those who can tame such a legendary creature must truly have the blessing of the gods. The Griffin's Glamour Bonus will greatly boost your team's Attack, Defense, Agility, and HP. It's Glamour skill, Swift Blade, is a stacking offensive buff that gives your team more and more Attack and Crit damage while reducing damage taken. We hope players will enjoy this new addition to League of Angels. Please look forward to more great content coming soon!